Update, March 2019: We’ve added lots of features and made significant improvements and updates since this post. 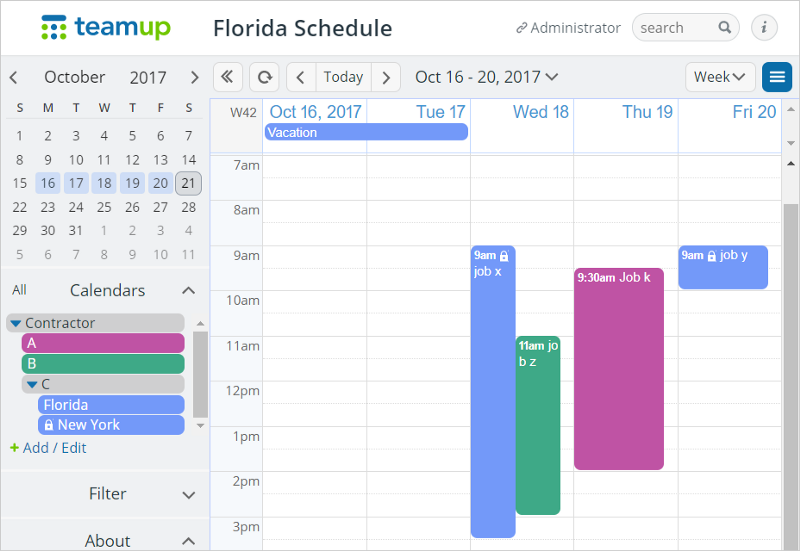 Check our monthly updates or read the latest user stories to find out how other organizations are using a Teamup Calendar to make work more efficient. A Teamup way to make the availability of shared workers visible to all stakeholders. A home remodeling company provides services to clients across multiple regions. The services are delivered through a network of contractors. Jobs are coordinated and scheduled at the regional offices. Some contractors work for only one region, others for multiple regions. For the sake of simplicity, we use Florida and New York as the two regions to demonstrate the challenge and the solution. 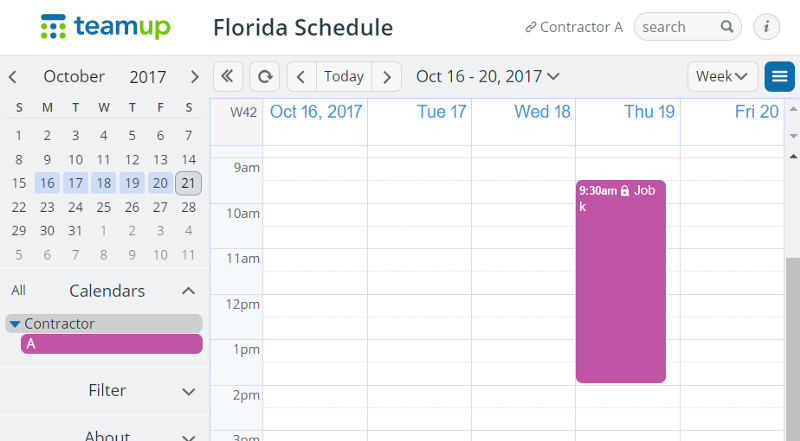 Mike, a scheduling manager in Florida, needs an overview of the availability of all the contractors who work for the Florida operation. Mike does not have access to the schedules in New York. To avoid conflict, Mike relies on his contractors to email him their scheduled jobs in New York as well as their planned holidays. Tony, the scheduling manager in New York has the same problem and does the same. Contractor C works in both Florida and New York. He needs to inform Mike about his schedule in New York and update Tony every time he gets a new job assigned in Florida. It’s inconvenient, inefficient, time consuming and error prone for all scheduling managers and the contractors who work in multiple regions. One master calendar is set up for each regional operation. The scheduling managers get at least the full modify permission, if not the administrator rights, to the master calendar in his region. Within each master calendar, a color-coded sub-calendar is added for each contractor. For contractors who work in multiple regions, he is given one sub-calendar for his primary region, plus sub-calendars added as iCalenndar feeds of his schedules from the other regions and nested in a folder under his name. This way all his schedules from all regions where he works are aggregated into one view. Using the same color for the same person who works in multiple regions gives the scheduling manager a quick view of that person’s availability. 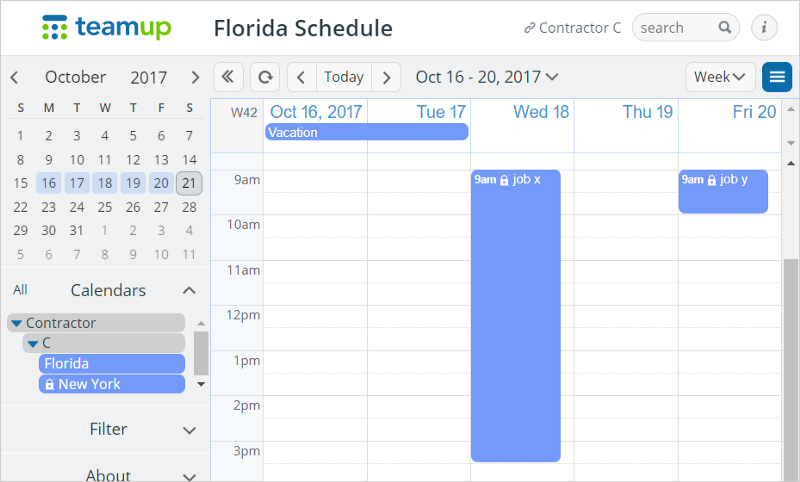 Contractor A works only in Florida and is given a customized calendar link to access his calendar with the modify-from-same-link permission so that he can add items such as planned holidays to the calendar directly. He has the read-only access to the jobs scheduled for him by the scheduling manager. Contractor C works in both Florida and New York. He is based in Florida therefore chooses Florida as his primary calendar. He gets a calendar link with permissions customized for him so that he can add items such as planned holidays to the calendar which would be fed into the calendar in New York, allowing the scheduling managers in New York to see his overall availability. 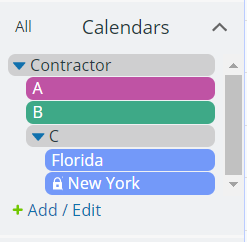 Contractor C only needs to use this one link from his primary region, Florida, and all tasks scheduled for him in New York are fed into the Florida calendar. Calendar access for contractor C who works in two regions. Mike, the scheduling manager in Florida, has the full access (administrator or full modify permission) to all contractor calendars and can view the availability of all the contractors working in Florida, including Contractor C’s schedule in New York. This ensures that Mike can avoid conflicts when scheduling jobs for Contractor C. He can use many filtering options to view the availability of each contractor. Tony, the scheduling manager in New York, has the full view of Contractor C’s schedule not only in New York but also in Florida, which enables him to avoid conflicts when scheduling jobs for Contractor C.
As the Chicago office discovers the solution in Florida and New York and comes on board, a new master calendars is created for Chicago. 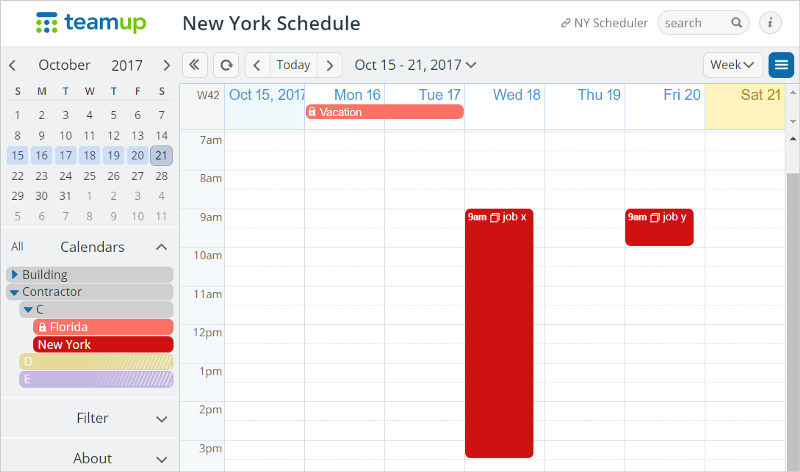 Assuming that Contractor D works for both New York and Chicago, some small change is required to add Contractor D’s schedule feed from the Chicago calendar to the existing New York calendar, and vice versa, so that both scheduling managers in New York and Chicago have the overview of Contractor D’s availability. Contractor D’s calendar link would now show his scheduled jobs in both New York and Chicago. No other changes are required to the existing calendar in New York. Given that Chicago is in Central Time while New York is in Eastern Time with 1 hour time difference, you may wonder if there would be time zone confusion for all the parties. No worries. All scheduled event time will be automatically converted to the time zone that the contractor or scheduling manager is viewing from. So for example, a 2pm conference call for Contractor D with his client in Chicago will appear as 3pm if he is in New York viewing from his calendar with time zone display set to New York. Important is to pay attention to the time zone indicator in the bottom right of any Teamup calendar. Any time on display in a calendar view or in an event editor is always relative to the time zone on display in the bottom right! Less busy communicating but more informed! For Contractor C who works for both Florida and New York, the communication burden to keep his managers informed of his availability due to jobs in the other location is now completed off. So are the managers. Whenever anyone of them makes changes on their calendar, the information becomes visible to the others automatically. Everyone is now better informed! Teamup offers iOS and Android apps available for free download on the App Store and Google Play. One of the advantages of the apps is that the calendar is accessible even if one does not have Internet connection, in which case the calendar would just display the data that was last synchronized with the servers when it was connected. If using the calendar in a Web browser is preferred, simply add the calendar link to the Homescreen of a mobile device for one tap opening in the future. Keep updating and stay updated anytime anywhere!